While countless individuals thrive on the warm temperatures that are happening, this is the time of year that I as a Canadian Citizen hate, because it also brings upon the Canada Commercial Seal Hunt. At this moment thousands of innocent seals are being shot, clubbed and dragged across the blood-covered ice towards fulfilling a quota that the Government permits, while still standing by their claim that this is all “humane”. Not only is this claim ludicrous, but I am racking my brain as to how anyone can believe such a statement, especially when there is absolutely no “humane” way to murder an innocent being. If we actually sat down and thought about this, it all leads to one “Major Thing” and that is profit – money being made off the shedding of innocent blood, no matter how torturous, horrific or disgraceful the process is... after all in their eyes these are just animals. According to sources the sealing industry will receive 2 million dollars if not more of tax payers money to fund this inhumane business. Millions of dollars that could go towards more imperative concerns and aid that will benefit everyone, instead of being wasted on a slaughter to provide seal fur luxuries and making of profit. The Canadian Government needs to acknowledge the outrage and inhumanity that this commercial seal hunt brings, and it is up to us as taxpayers and humanity to have our voices heard and oppose this horrific slaughter of life.. because after all, do we really want our tax dollars going towards the tortures and deaths of innocent beings? 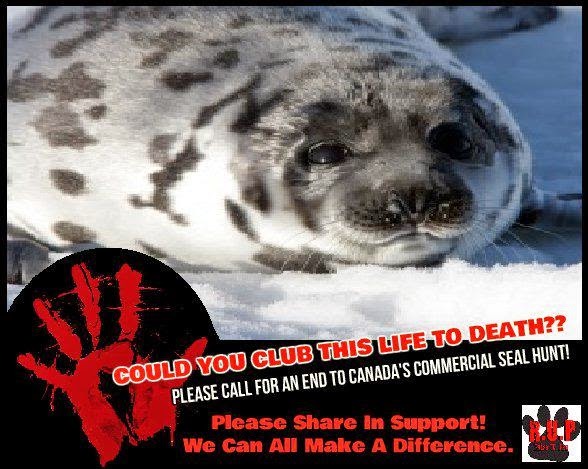 Let’s All Make A Stand to #STOPSEALHUNT.. Life is Precious and Priceless! IS DOG MEAT BEING TAKEN OUT OF YULIN FESTIVAL??? LETS GO ORANGE - Please Help Make A Difference! MAKE A PACT! Preventing Animal Cruelty Together!